Michael Webb checks out what’s on the menu in France’s bustling cuisine capital. Celebrity chef Paul Bocuse has promoted Lyon as a gastronomic destination, which boasts his three star shrine, and a dozen other restaurants with at least one Michelin star, plus a rich choice of brasseries and humble bouchons. To whet your appetite visit the food market on the Quai St Antoine, every morning but Monday. There’s much more besides the good eating. Lyon is one of the great French cities: industrious, inventive and elegant, and its historic center is a UNESCO World Heritage Site. This hilltop settlement overlooks the narrow strip of land between the Rhone and the Saone, where Renaissance monuments, squares and museums are located. Silk weaving brought prosperity and the riverbanks are lined with the owners’ mansions. It’s a city that could retreat gracefully into the past; instead it’s vigorously reinventing itself. That process of renewal began nearly a century ago, when the visionary architect Tony Garnier planned a modern city and created the Quartier des Etats-Unis, a district of residential blocks that have been well maintained and adorned with fanciful murals. A little museum in one of these blocks celebrates Garnier’s work—which includes a stadium, a school, and a vast abattoir, newly restored as an events space that seats 7000. Lyon was the birthplace of movies in 1895, when the Lumiere brothers made a one-minute film of workers leaving their factory. The factory has been replaced by a screening room for rare movies, but the hideously ornate family house survives as a museum of early cinema. Here you can watch the first thriller—a train entering a station and appearing to burst through the screen—which sent early spectators fleeing for the exit. Families stroll along the Champs-Elysees in Paris, blissfully unaware of the cameraman—a time capsule of a vanished world. Further east is Villeurbanne, a model suburb built up in the 1920s and 1930s with a monumental Art Deco city hall and theater on a broad axis that is framed by two long ranges of crisp modern apartments. On a Saturday afternoon, the city hall hosts a succession of weddings—Armenian, African, and even French—the parties parading down the twin staircases, and dancing in the forecourt. Within are two photo-murals that celebrate the Liberation in September 1944: one of the local Resistance brigade, and the other of an incredulous GI being carried on the shoulders of cheering locals. Lyon was a center of anti-Nazi resistance and the former Gestapo headquarters has been turned into a museum that commemorates that brutal era. A new Lyon is rising from a former industrial zone on the narrow wedge of land above the confluence of the two rivers. Sleek trams link it to the network of metro lines and the rest of the city. Housing blocks surround a marina, there’s a huge shopping center (of course! ), and some daring new commercial buildings facing the Saone. The best of these is the Orange Cube, whose perforated metal skin is as light and airy as a cluster of soap bubbles. The ground-floor is a major outlet for RBC, a contemporary furniture store with branches in other southern French cities. In a couple of years the Museum des Conflueces at the tip should be open. To the north is the highly rated opera house, which was transformed by Parisian architect Jean Nouvel. Try to catch a performance of music or dance. Lyon makes a great center for exploration. Villages and vineyards, orchards and Roman remains are scattered over the hilly terrain. Le Corbusier’s monastery of La Tourette and his church and cultural center at Firminy Vert are an hour’s drive. The museum in the industrial city of St. Etienne has one of the finest collections of modern art in France. An hour to the south, in the village of Hauterives, is the Palais Idéal du Facteur Cheval—a stupefying stone folly created by a postman working alone over 34 years. It ranks with Watts Towers and other masterpieces of outsider art. 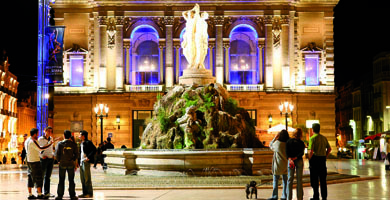 Lyon is two hours by TGV from Paris and gastronomes take the train just for lunch, but the city is worth a stay of three days or more in one of its many hotels. Enter your email address to subscribe to our newsletter and get the best travel advice straight to your inbox!